Breathing while we sleep is important - nobody should find this fact surprising. What is surprising, is that a large number of people have a condition called Obstructive Sleep Apnoea, and may not know about it. Obstructive Sleep Apnoea is a condition wherein the soft tissues of the throat relax so much while you are asleep that they prevent air reaching your lungs. People with this condition wake up very briefly without remembering, so they can breathe properly. The result is a disrupted sleep that doesn't leave you feeling restored or refreshed, which in turn increases the risks of snoring, diabetes, heart disease, and day time fatigue. Diagnosis of Obstructive Sleep Apnoea with the use of a take-home monitoring device and input from a consultant sleep physician. Treatment of Obstructive Sleep Apnoea with masks and machines that provide Continual Positive Airway Pressure to keep your airways open. 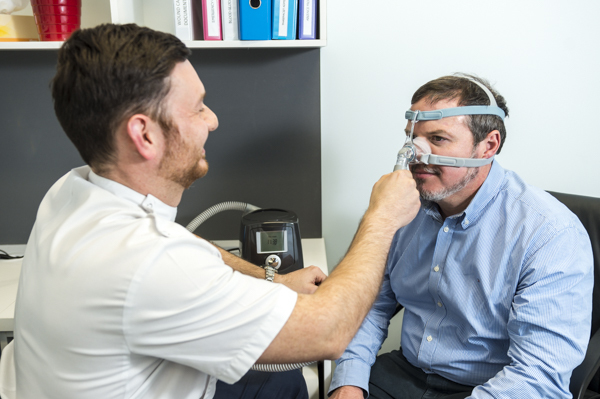 Hire of masks and Continual Positive Airway Pressure machines for short term use (especially useful when you are on holiday and you have left your own at home).